LYNN B. UPSHAW is a leading brand strategist and corporate consultant whose clients have included a broad range of Fortune 500 and Internet companies. He is the author of Building Brand Identity (Wiley), and coauthor of a monthly online analysis of Internet brand building. EARL L. TAYLOR, PhD, is Senior Vice President of Research International/Cambridge, and a frequent advisor to major corporations on brand research and brand-building programs. MANDATE: BUILD THE CUSTOMER'S COMMUNITY. THE INSIDE JOB: COACH THE CUSTOMER'S TEAM. Masterbrand: Charles Schwab & Co. 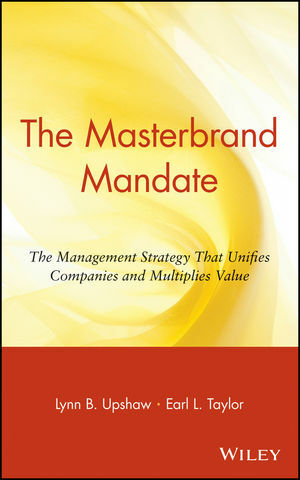 THE WORLD OUTSIDE: MANEUVER THE MASTERBRAND. Moving Forward with the Mandate.